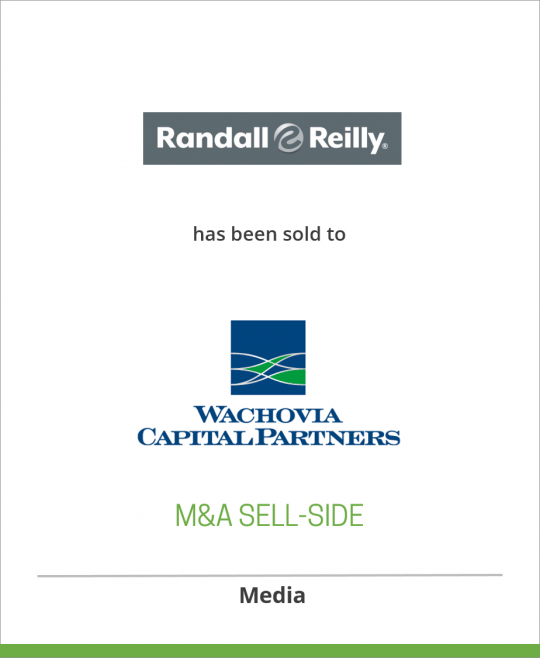 Randall Publishing Company, a leading B2B media company serving the trucking industry and other sectors, has been acquired by Wachovia Capital Partners. Founded in 1934, Randall Publishing Company is the premier business-to-business media company focused on the trucking and construction industries. Its properties include Equipment World, Overdrive, Truckers News, CCJ and Modern Woodworking magazines. It owns and operates several online media entities, including www.eTrucker.com, www.equipmentworld.com and www.modernwoodworking.com. Also under the company’s umbrella are the Great American Trucking Show, radio programs, a billboard company, a company-sponsored publication division serving Fortune 500 companies, and a UCC-filing database and research group. Based in Tuscaloosa, Alabama, the company was recently ranked the sixth-fastest-growing publishing company in the nation and the 22nd largest. Chairman Dr. Catherine J. Randall led the sale of the company on behalf of its controlling shareholders – the family and estate of H. Pettus Randall III. Wachovia Capital Partners and F. Mike Reilly, Chief Executive Officer of Randall Publishing Company, have formed a new entity, Randall-Reilly Publishing, LLC, to manage Randall Publishing Company. Under the new company, Mike Reilly will remain as CEO, with David Wright as COO and Shane Elmore as CFO. The company’s headquarters will remain in Tuscaloosa, Alabama, and no staffing changes are planned. Reilly joined the company in 1975 and became president in 1984. Under the leadership of the management team, the company grew into one of the country’s fastest-growing business-to-business publishing firms. Visit the company’s Web site at www.randallpub.com. Wachovia Capital Partners had committed approximately $3 billion in capital since 1988, and invested in more than 200 businesses, including a number of them in publishing.